Travelling by bus is every other day thing, in other words we can say it is the common mode of transportation of people among India. It brings us in contact with common people who prefer buses as the mode of transportation for travelling long distance for their day to day work. Travelling in buses can be bit uncomfortable sometimes, but the expenses and the time let us cope with this discomfort. In this world of modern era when everything is online the stores like Redbus, Abhibus, Travelyaari, make my trip and other online ticket booking stores makes your travel easier by offering you with instant ticket booking options, your choice seats, comfort for long distance travel; let you enjoy these online services. The coupons offered on these online booking services make your trip more comfortable and enjoyable. Just download its app chooses your destination make secure online payment and enjoy your trip. Use your ICICI Bank Credit Card to make your next booking at My Bus Tickets and get a discount of 10%. Offer available on My Bus Tickets Website only. Use the promo code at the time of booking. Get 20% cashback when you book bus tickets. No minimum booking is required. Offer is valid only on GSRTC, UPSRTC, RSRTC, APSRTC & HRTC bus tickets. Offer is valid only for new users. Cashback will be credited within 24 hours of the transaction. Save Rs.150 when you book bus tickets for Rs.2000 or more from Travelyaari. It is a one time user offer. Offer not applicable on public transport buses. Use promo code to avail the discount. Now get 30% off on your first hotel booking. To get extra 20% cashback apply the given coupon code at final payment. Offer is valid for first-time users only. Don't miss this deal. Book your bus tickets from Travelyaari and get 7% off. You may get the maximum discount of Rs.75. Minimum booking amount should be Rs.300. Use the coupon code at the time of booking. Download RedBus App now and get Rs.1000 cashback on your first booking. Offer applicable only on bookings made through App. Use the coupon code at the time of booking. Travelyaari is giving a discount of Rs.50 on your bus bookings all over India. The minimum booking amount should be Rs.500. Book now to enjoy this amazing deal. Avail a discount of Rs.2000 on your Bus Hire Bookings at RedBus. This offer can be used by a user twice. Offer applicable on bookings made through Website and Mobile App. Use the coupon code at the time of booking. If you have booked bus tickets from Redbus then you can avail a discount of up to 80% on hotel bookings. To redeem this offer use offer use your bus ticket number as the coupon code. Avail a discount of Rs.500 on your Bus Bookings of Rs.10000 or more at RedBus. This offer can be used by a user twice. Offer applicable on bookings made through Website and Mobile App. Use the coupon code at the time of booking. Download the Travelyaari App and get Rs.40 off on your bus bookings. Offer can be availed 5 times by a user. Minimum booking amount should be Rs.200. Use coupon code at the time of booking. Book bus tickets for Rs.1000 or more from Travelyaari and avail a discount of Rs.80. Offer is applicable once per user. Offer not applicable on RCT/Govt. Buses. Use coupon code at the time of checkout. Book a hotel room with minimum fare of Rs.750 from RedBus and get a discount of 60%. Offer applicable on first hotel booking transaction only. Discount may vary for hotels and availability of rooms. Book now to grab this amazing deal. Enjoy the September Sale running at Abhibus and get a cashback of up to Rs.200 on your bookings. Amount of cashback depends upon your booking amount. Use the coupon code to redeem this offer. Get a discount of 15% on your bus ticket bookings through My Bus Tickets. Offer applicable on bookings made through Axis Bank Credit Card only for using EMI options. Offer valid on booking done by My Bus Tickets Mobile App or website. The customer needs to enter the promo code at the time of booking. Make a bus booking for Rs.20000 or more from Redbus and get a discount of Rs.1000. Offer applicable on using coupon code only. Coupon code can be used twice by a user. Use your ICICI Bank Netbanking, Credit/Debit Card for making payment for your bus tickets at RedBus and avail a discount of up to 15%. It is a one-time useable offer. Applicable only for existing users. Get up to 15% off when you book bus tickets for AP & Telangana from RedBus. Minimum ticket amount should be Rs.300. Offer only valid if you use the given coupon code. 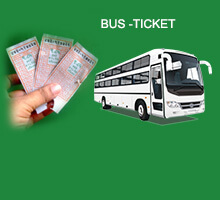 Enjoy the cheapest rates on bus ticket bookings at My Bus Tickets. Now travel from Ahmedabad to Broda in just Rs.180. No coupon code is required to avail this offer. Travel from Lucknow to Kanpur with the lowest fares possible. Book tickets at My Bus Tickets starting from Rs.500. Offer available on services like Sleeper, Volvo and AC Busses. Book now to save your money. Bus travel is the best adventure proved so far, which is admired by all the local travelers. Travelling through bus believed to be one of the best ways to travel as it closely connects to the beautiful cities and towns. Whether it is your honeymoon destination, business trip, holiday’s adventure or any other plans you can choose your services from the widest range of available buses like Mercedes, Volvo, Volvo AC, AC luxury, Deluxe, Sleeper, Express and other private buses. Bus journey will always bring you with a memorable experience. There are a number of Indian small towns where you need to travel by these buses and need to explore more your beautiful country. Online bookings have brought more comfort as you know about the exact timings, rid of standing in queues while booking your tickets, frequency, and the destination is available right at your tips. Apart these online bookings let you enjoy royal services like free WI-FI, easy tracking, and fast booking will make trip a lifetime moment. 1. RedBus- Founded in August 2006 this online platform operates over 60,000 routes and is connected to 23,000 bus operators. Named as India’s top ticket booking service provider Redbus is the global choice of over 8 million customers. A dedicated team is available 24/7 in your services and offers you best experience at relatively lower rates. 2. AbhiBus- You can book your bus tickets for over 2500 operators at a single destination. Affordable range and better services will keep you connected to this online ticket booking destination. Now traveling will no more be a headache when you are in this online store. Just with few clicks book your tickets and enjoy your comfortable journey. 3. TicketGoose- Aims to offer its customer best services this online store is admired for excellent customer store and affordable range. Focus on providing endless service this online store serves more than 3000 destinations and make available services of over 10,000 buses to 20,000 routes. When you make your bookings from online ticket booking portals like Goibibo, MakeMyTrip, Redbus, AbhiBus, ClearTrip, Yatra.com, RunBus, Flymantra, Ticketgoose, and others you get a number of discounts offers available on your booking. Further, these online stores have tie-ups with several travel companies that provide buses with various facilities – AC, non-AC, sleeper, non-sleeper, semi-sleeper AC, SemiSleeper non-AC, Mercedes Benz buses, and others which provide you with complete comfort while traveling to your favorite places. Planning holiday trips and business trips have become effortless with the availability of these discount codes. Booking tickets through credit cards or net banking at these online stores will offer you with melting discounts that keeps you wanting for more. Apart from downloading the mobile version of these online booking portals will keep you notifIED with the discounts offered by these online stores and gives you a chance to grab best opportunity to book economical tickets to your favorite destinations.